Yes, it is possible to go on holidays while on dialysis! The world is filled with beautiful places to see. There is so much fun to be had. Never, for a moment think that because you are on dialysis, your ability to travel is finished. Traveling on PD is very simple. You need to either carry your supplies with you or have them delivered to you at your destination. You can also pick them up from some place close by if the destination you are traveling to does not have a vendor. Once you have your supplies, it is simply a matter of doing your exchanges according to your schedule. Just make sure that you follow the exact same procedures as you do when you are at home. Remember to carry your dressing kits to use once you shower or bathe. There are two options for traveling on hemodialysis. You can do short trips - weekend getaways, if you will! Try to leave on the day of dialysis, after a session. And come back before your next session. that way, you can easily do a 2 or 3 day trip. Just be careful with your fluids and diet during the trip however. Mostly this should not be a problem since you are going to be busy enjoying the place that you will not have the time to think about fluids! You can do long trips to places which have a dialysis center. That way, you can continue with your normal dialysis schedule and enjoy the place. Most dialysis centers will accommodate tourists. So, get the telephone numbers of the center preferably at least a month in advance and call them. Speak to the head of the unit and tell them that you need to be dialysed during your trip to the place. Request them for a convenient timing. Most people will be helpful because they would love to see dialysis patients trying to lead a normal life. 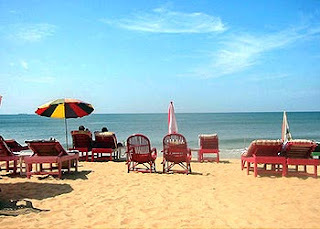 Goa is an excellent choice for a holiday for people on hemodialysis. There are two very good units and it is a great place to enjoy! See the section on Hemodialysis Centers for the contact information of the dialysis centers in Goa.